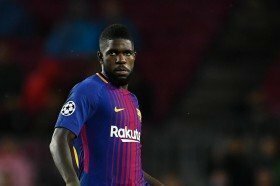 French centre-back Samuel Umtiti is said to have no plans of parting ways with Barcelona amid the speculated interest from Arsenal. The France international has endured an injury-plagued season with the Blaugrana, and this has restricted him to just nine starts in the Spanish La Liga. Amidst this, there has been the speculation that the Gunners hierarchy have made contact with Barcelona chief Eric Abidal regarding a summer move, but the defender does not seem keen on the same. According to Sport, Umtiti has no plans of ending his association with the Blaugrana in the summer despite knowing that the club may pursue another central defender. Ajax's Matthijs de Ligt has been widely fancied to make the switch to the Camp Nou when the season concludes, but Umtiti is determined to fight for his place under manager Ernesto Valverde. Umtiti recently started his third league game in as many months against Villareal where Barcelona played out a thrilling 4-4 draw. Luis Suarez scored the key leveller with seconds left on the clock.